After a year of preparation, the day of arrival finally arrived. Due to an overbooking of the economy class, Arno and I got a place on business class. Thanks Brussels Airlines! Our flight landed in the evening and we had no trouble falling asleep at AMCES, our hostel in Cotonou. Cotonou is very chaotic. The next day we discovered this megapolis. While there are no high buildings to be found, the traffic makes it clear that this is a city of over a million inhabitants. 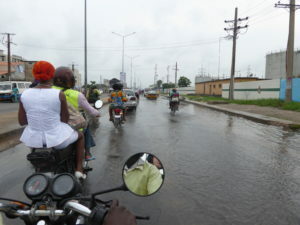 The zemi-johns, small motorcycles that serve as a taxi, are the main way of transport over here. The priority rules don’t seem to apply here. Instead the one that has the loudest honk has the priority. It takes some time to get used to sitting at the back of such a zemi-john, but once your used to it is fun! On the first day we completed a list of local contacts we gathered to find information about a motor we need for our project. By the afternoon we found ourselves a guide for the market of Dantokpa, the biggest market in West-Africa. This market welcomes 100 000 daily visitors and is home to 20 000 stands. You can find everything from recycling stations, to jewellery and it even has its own fetish section. There you can find all kinds of voodoo accessories here. Our guide, a radio-animator on a local station, even found us an electromotor in one of the many small corners of the market. He showed us the local police station and we watched the defeat of Argentina against France in the market’s own fire station. With every goal there was a huge shouting and you frequently heard ‘La France, c’est l’Afrique!’. Marie-Ange, our guide brought us unexpectedly to the radio station of Radio Tokpa in order to have an interview with us. Before returning, we visited the voodoo-priest of the market, who kindly blessed our project. What an intense first day! The next day was Sunday. When we woke up, we immediately noticed that we were not going to have a productive day. The rain season has started here, and the streets were flooded with water. It had rained all night and all morning. You don’t see such rain in Belgium. In order to get bread, we had to walk through water reaching our ankles. In the afternoon the weather got better, so we decided to go to a restaurant at the beach to get a real African meal. The beach was nowhere as idyllic as the côte d’azur, but apparently, it’s better outside of the city. The slums reached until the water and the ocean was filled with plastic. Where would that come from? 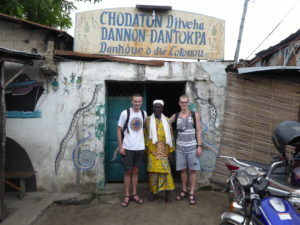 In the evening the other project students arrived, they would stay in Cotonou for some days as well. With the group we went to a local festival, where the Beninese lifestyle reigned. Everybody was dancing and enjoying the night. Wherever we looked, we saw people drinking ‘la Beninoise’, a beer that we, Belgians, liked very much. It was an interesting experience to be the only white persons amongst thousands of people. Back to the project. Using the contacts, we obtained the first day, we managed to visit an office where they provided telecom and solar solutions. After explaining our project, they provided us with a lot of useful information. They knew about two places in Cotonou where could find the motor needed for our solar mill. The first being the same market we visited the first day. The other one was a Chinese vendor of agricultural appliances. After half an hour on the zemi-john we reached this vendor. He told us how the president recruited him years ago to elevate the Beninese agriculture. In the end we decided to buy the motor from him, which brought us another step closer to reaching our end goal. 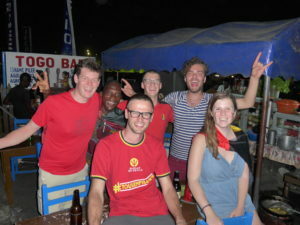 After returning to our hostel we prepared for the upcoming match where Belgium played against Japan. With the others we went to a local bar in full supporter’s outfit. Our presence transformed the whole bar into a Belgian fan club. La Belgique, c’est l’Afrique? After an exciting game, we went home early to prepare for our journey to Parakou, a city in the north of Benin. This is the place where will finish our project. During the night we got ill, so we had to cancel our bus trip. Hopefully our next update will be from Parakou! Bienvenue à la ferme de Sokounon!